These funny-looking twin organs may not look like much, and yet they are most precious to the body’s normal functioning. Day and night they keep guard to be on a lookout for toxins coming their way. Because the industrious kidneys’ main task is to flush away all waste, acid and extra fluids. You can count on them to maintain a healthy balance of salt and minerals in the blood. They also have a hand in producing certain hormones that control your blood pressure, create red blood cells and contribute to bone health. No wonder these bean-shaped organs are so valuable. They tirelessly work for our benefit and it's only fair for us to repay the favor. We can let kidneys catch a break from time to time if we stick to a healthier diet. To do so it’s important to understand that there are foods that pose a hazard to poor kidneys and need to be avoided, especially by people with bladder stones. Learn why a proper diet plays a pivotal role in the health of these cute organs. The formation of kidney stones happens when a person fails to drink enough fluids and, in addition, eats the foods that form excess waste. The stones can be teeny tiny and easy to get rid of or as big as a ping pong ball. They can be a bitter presence in the kidneys for years without causing any pain. Anguishing sensations follow when the stones start traveling through the bladder tunnel. They can damage the ureter with their sharp edges causing blood in the urine. If you have spotted blood in your pee, immediately schedule an appointment with your physician. Having said that, of course it’s much better to stop a problem long before it hits. And the diet for kidney stones prevention should be one of the priorities in that quest. Gut and kidneys are not distant relatives, as one might think. Quite on the contrary - they are very closely related. Our gastrointestinal tract hosts a trillion of bacteria. Some foods can change our microbiome and promote chronic diseases. And, on the contrary, some others can immensely contribute to kidney health. The following kidney-friendly advice is also suitable for preventing heart diseases, cancer, and diabetes. 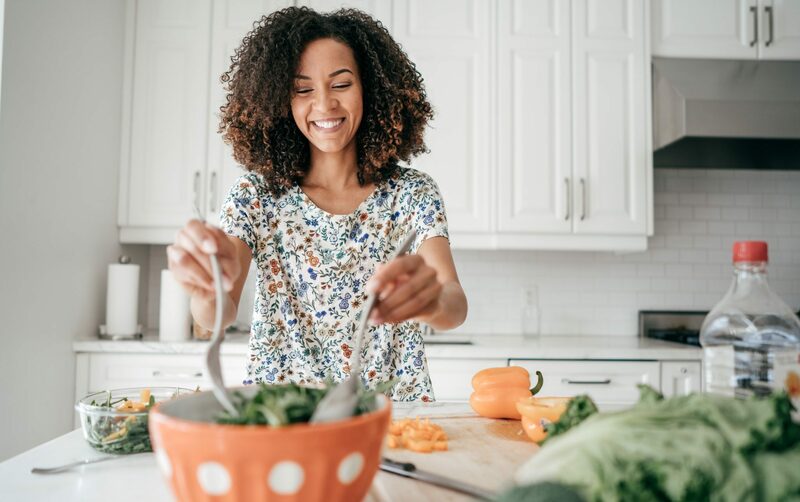 Give preference to the foods that inhibit the formation of bladder stones, such as citrus fruit, cauliflower, berries, fish rich in omega-3 fatty acids, grapes, pineapples and other fruit, legumes, egg whites, whole grains, olive oil, lean turkey, foods rich in fiber and more. Arugula deserves a special mentioning. It easily fits into a renal diet being a nutrient-dense superfood. It’s low in potassium which makes it a great choice both for urinary and women’s health. The nitrates contained in arugula help significantly lower blood pressure—an immense benefit for people with kidney stones. Sufficient water intake is vital for bladder stone prevention. And sufficient means at least 10 glasses of water a day. When urine changes its color into darker shades of yellow it means the amount of water you drink is not enough which can lead to stone formation. High level of sodium in foods jeopardize the normal functioning of kidneys and increase your risk of developing bladder stones. Usually limiting your intake of fatty, greasy and all kinds of processed foods helps to dial down sodium levels. Some foods are normally considered good but can sometimes be bad for kidneys. Calcium is crucial, first and foremost, for bone and joint health. However, when it comes to bladder stones, calcium is the most abundant mineral you’ll find in there. Mind, however, that low-calcium diet can be harmful, too. So, to find yourself in a win-win situation, stick with whole food sources of calcium and keep its intake under control. High protein diet puts a lot of strain on kidneys requiring them to work double shift. For a person with kidney stones a moderate protein consumption may be the way to go. If your doctor has noticed a worsened kidney function in your blood work they might recommend you to switch to a plant-based protein. For stone prevention add more fruit and veggies to every food intake. 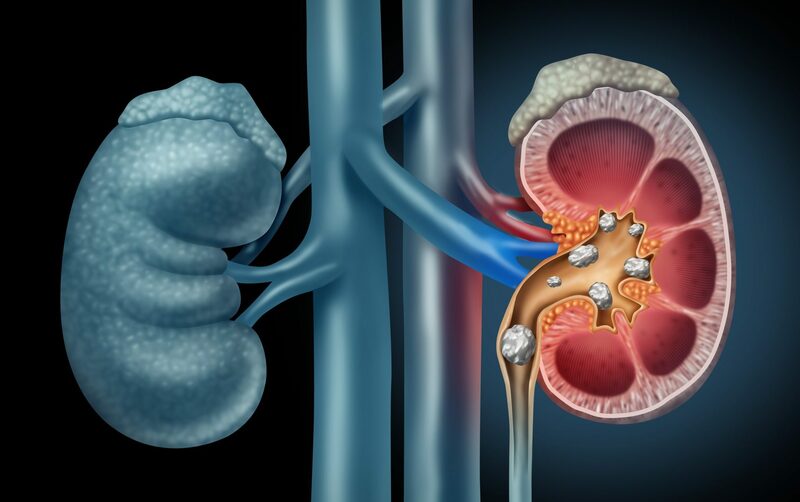 If foods that I’ve mentioned before fit into a gray area, refined and processed foods and by-products are definitely the ones you need to avoid altogether in order to prevent kidney stones. These foods are harder to process which gives your detoxifying organs additional work to do. Cutting down on fast food, refined sugar and sodas will help you prevent the development of bladder stones. Diet experiments—and there are plenty of those these days—сan significantly concentrate your urine. Low-fat, high-protein, low-carb, and I’m sure a host of other extreme diets, make urine more acidic, increase calcium in the urine, which over time leads to kidney stone formation. It’s much safer to experiment with your training plans than task the patience of your kidneys. It’s important to take good care of your kidneys by protecting them from toxins you can avoid and by empowering them with vital nutrients. This way we help them help our bodies function as good as possible.